Somewhere in my mid-teens, one of my best friends and I went fishing at a small lake nearby. It was a bust, but on the way home we listened to a local radio station that played offbeat music that you wouldn’t hear on the usual generic pop or rock stations. A song called “People That Are Going to Hell” by The Vandals began to play and we liked it even though we never heard of The Vandals before. It was a somewhat catchy punk song with amusing lyrics so it naturally got stuck in my head for a while. It wasn’t long before that I had their entire discography and found myself listening to them more and more. Picking my favourite album by them is difficult, as with any other of my favourite bands, but I did end up finding one I could listen to front start to finish. There’s a bit of an oddness to the album I chose though. It’s a country album. Besides this album, The Vandals don’t really play country music as they’re a punk band. I don’t really like country music, though I admit there is the odd tune I enjoy. 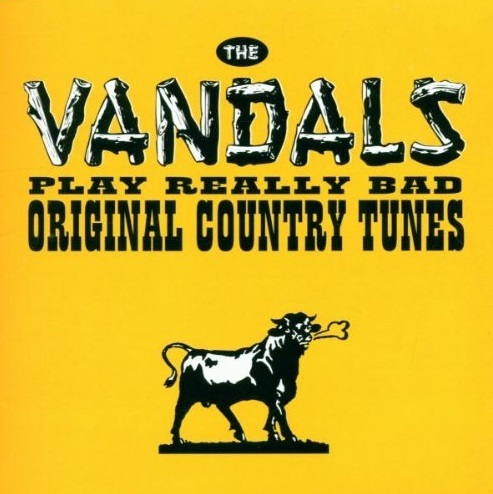 So oddly enough, “The Vandals Play Really Bad Original Country Tunes” ended up being my favourite album of theirs. The album was originally released as “Slippery When Ill” though I enjoy the latter as it has a couple of additional songs that were not on the original. Without a doubt, my absolutely favourite song on the album is called “Elvis Decanter”. I would even go as far as to say it is amongst my favourite songs of all time. It just has a great rhythm and to me is the perfect mix of country and punk. Whether it was on purpose or just a great accident, the song’s lyrics are sad and seem to follow a similar formula that many original country songs utilize. A man who loses his girl due to alcoholism which was enabled by his lover. Slightly clichéd, but the lyrics end up being a little depressing. The only thing it seems to lack is mention of a horse, truck, and maybe a sunset. It looks like this my shortest recommendation I’ve written. It’s also probably the most poorly worded one too. But I’m too lazy to go back and rewrite most of it. So in summation, if I had to pick my most beloved of all albums from The Vandals, this would be it. It’s fairly unique and very different from all their other stuff. If you like country music but not punk, still give this a try. If you like punk music but not country, give it a try too. If you like neither, why the hell did you read this? This entry was posted in Recommendations and tagged Country, Music, Punk Rock, Slippery When Ill, The Vandals, The Vandals Play Really Bad Original Country Tunes. Bookmark the permalink.